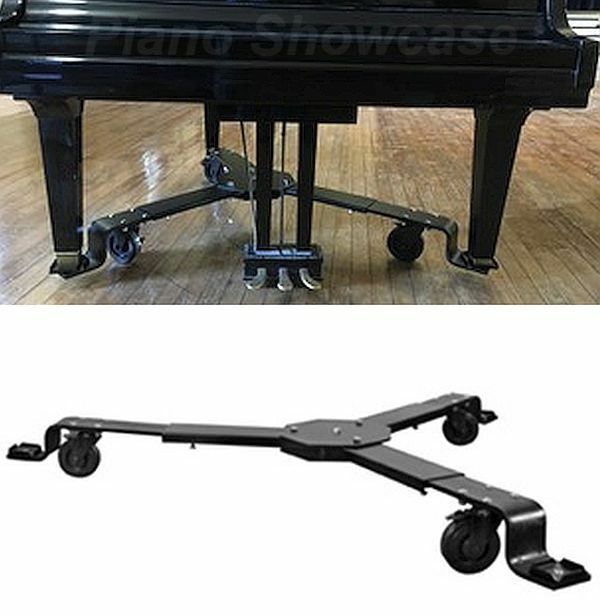 Schaff Adjustable Grand Piano Truck Dollies made in the USA are so sturdy, that they're the only ones sold with Unlimited Liability Insurance. Some pianos have a smaller leg print - check the specifications link below to see if your piano falls under a size exception. Three sizes with a Shipping weight of 115 lbs to 152 lbs. The Schaff dollies come equipped with three 5" diameter, locking swivel casters with black polyurethane "Hi-Tech" wheels. They're made of solid 1/2" thick U.S. steel and have brakes on all three of the wheels to prevent the piano from shifting position when in service. The steel telescoping arms are easily adjusted to the angle of the piano legs, at the center of the dolly. At the end of each leg is a 3-1/2" square swivel socket to hold the piano legs. The piano is raised only 2-1/2" from the floor, no higher than regular casters, so there is no interference with playing. Powder coat black baked on finish. These are the same sturdy Grand Piano Truck Dollies we've sold to the United States Air Force & Navy, and to Universities, Churches, Concert Halls, Studios, Senior's Residences, Schools, Theaters & Hotels all over the world! An essential accessory for moving your Grand Piano from room to room with ease and safety. Grand Pianos should never be moved around on their own legs. It will cause the bolts to strip and eventually break the legs. Replacements parts are always available. For Grand Pianos 4'8" to 5'11" - 3" square sockets. PLEASE NOTE: If your 6' to 7'6" Grand Piano has existing 5" diameter wheels, you will need the #S-4013SB Medium Dolly with larger leg cups, in order for the pedals to work. 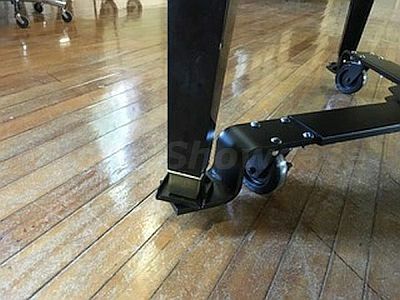 PLEASE NOTE: If your 9' Grand Piano has existing 5" diameter wheels, you will need the 4014SB Special Bend Dolly with larger leg cups, in order for the pedals to work. Because of the way the legs are situated on the following pianos, please see the Size Exceptions. For 6' & 6'1" Yamaha, Young Chang, Kawai & Samick grands please order the #4012 Small Dolly. Also the Yamaha 6'6" and the Baldwin 6'4" require the #4012 Small Dolly. If possible, please type in the Make & Size of your piano in the comment section of your order form. Remove wheels before placing piano on the dolly. The Schaff piano dolly from V King Piano Showcase is a great deal: the price was the lowest anywhere. Shipping was efficient and prompt. The dolly itself is marvelous: strong, easily assembled, made of fine, substantial materials, including big ball-bearing locking casters, polished steel bolts, and a handsome black semi-gloss finish. It's great, vital protection for any piano that's often moved. exactly what we expected. Heavy. Three boxes. instructions completely pictorial. on Yamaha, to remove caster, jack up piano, insert a prop, remove leg, remove caster cup screws, replace leg. To place it on the truck, put a 2x4 block under each cup so that the frame does not fly up when you put the weight of the piano on it. know what you are doing/ 90 minutes by yourself; or call a pro! Good experience dealing with Vandaking/Kelly. Web page info, ordering/payment online went smoothly. Service provided on phone excellent. Referred to another manufactor's "you tube" to find out how to place the piano up on the dolly. Your assembly sheet OK, but your info to put the piano on the dolly not helpful at all. Kelly told me about the blocks. You didn't. Needs to be revised. I ordered this piano dolly for our 5 foot baby grand so that we could move it easily from one part of the house to the other. It was simple to put together, and it performs the job extremely well! Our piano movers actually put our piano onto the dolly, so I can't speak to how easy/difficult that might be, but I'm thrilled with the purchase and how easy it is to relocate the piano. I ordered this piano dolly to carry a Steinway S, and wanted it to be delivered first so that the piano movers could set it up. It shipped quickly, and arrived sooner than I expected. Setup was easy, but it was good that I had the piano movers there to load the piano onto it--it's not a one-person job. It's rock solid and moves easily; set the brakes before playing!